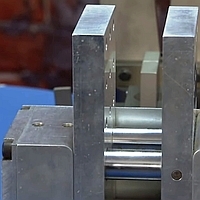 Demonstrating Grippers, Clamps, and Stopper Cylinders Video Tutorial by Fabco-Air, published on Oct 25, 2013. The Original Pancake® Air Cylinder was designed in 1958 by Alfred W. Schmidt, the founder of Fabco-Air, Inc. Today, over 5 decades later, Fabco-Air offers a complete line of pneumatic actuators. Specialized needs by our customers have led to specialized products by Fabco-Air. The first part of this video explains Grippers and the difference between Angular Grippers and Parallel Grippers along with all the sizes and unique capabilities built in to each series. The following Swing Clamps, and Stoppers video demonstrations each explain the use these robust products to enable effective work solutions. Contact Fluidline Components, your stocking Fabco-Air distributor, for additional product information, price, and delivery.